Gold Country Driving School was started in 1995 by Ron and Melissa DeLaney. They wanted to make a difference in their community for the people driving the roads of California. They have since expanded their business to include: Recreational Vehicles, Off-Road (4 wheel drive) and Defense Driving seminars to satisfy OSHA requirements for many companies. Our instructors have met the qualifications and required testing demanded by both the State of California DMV and our school. The training of our instructors and students is a constant and ever changing goal at this school. By our students gaining the knowledge, judgment and confidence, we feel we are on the right road towards achieving our goals. 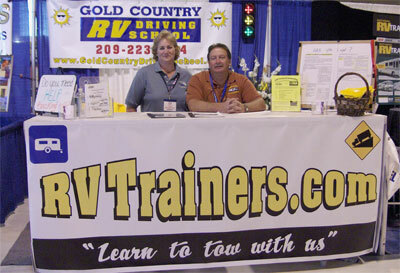 Gold Country RV Driving School Instructors have a combined 35 years of experience RV’ing and take pleasure in training new RV’ers. They still take the time to get into their RVs and head to the great outdoors at least once a month with their families. Ron, Melissa and others can also be seen attending RV Shows in Northern California with their booth; to display pamphlets, providing advise, and answering questions about RV’ing. We can provide you with tips from purchasing, maintenance, driving and backing, as well as DMV licensing requirements.